Separation anxiety is a panic disorder, or a phobia, similar to a fear of heights or spiders. While we don't know what *causes* separation anxiety, we do know what some risk factors are; like a sudden loss of a beloved human or a big move across the country. It can be heartbreaking to witness your furry friend begin to panic while you're getting ready to leave and can be equally frustrating to come home to torn up carpet and noise complaints from neighbors. Your dog isn't eating your shoe because he is mad at you and he isn't breaking out of his crate because he is stubborn about being crated- he is terrified of being left alone and so it is crucial that we change his emotional state. With the proper training protocol and, for some dogs, support from a veterinarian, there's a good chance we can change your dog's emotional state from full-panic to relaxation. On average, 73% of dogs who go through separation anxiety training have had tremendous improvement and even complete resolution. It is possible to see great progress and even complete resolution of your dog's separation anxiety. I can help you get there. When teaching a dog to be relaxed when left alone, we must introduce alone time gradually. The first several weeks may seem like no progress is being made but once we start to see progress it often builds quickly. The time it takes to make progress will depend on your dog. We don't set the pace here, your little buddy does. 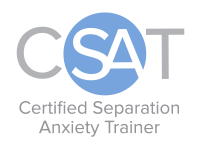 The unique part about separation anxiety training is that it is done from the comfort of your home. We will utilize easy-to-use technology which makes training not only convenient but also keeps the setting realistic. Who can go through the training protocol? Because training is done in the comfort of your home, there are no limits to where you live! As long as you speak English and live in North America, we can work toward resolution of your dog's separation anxiety. This specialty program focuses on separation anxiety. Each package is four weeks in length. I require a minimum of a four week commitment. Each week you will receive one live assessment with me and five missions that you will complete on your own as well as continuous support as you work through this heartbreaking phobia. For more information or to take advantage of a free phone consultation, fill out the contact form below. I honestly don’t even know where to begin.. We reached out to Allison for separation anxiety training after we moved into our new house and one of our dogs destroyed two bedrooms by pulling up the carpet. For as long as we’ve had him (2 years) destruction was a common theme while we were gone. Trust me when I tell you we’ve tried nearly everything! Kennels were use less, toys with treats in them were laughable since he was smart enough to figure it out, music did nothing to calm him. We’d go months with no issues than- boom- a destroyed video game. After reaching out to Allison we had our first session almost immediately- she worked with us on our schedules to make it the most effective and a completely personalized training. I won’t lie and say it was 100% easy for us humans to do but my husband and I would remind ourselves the commitment we made to adopting this dog. In the end it took 6 months for us and Rascal to regain confidence in leaving him alone. We couldn’t have done it without going through Separation Anxiety Training with Allison- her knowledge, clear instructions, and flexibility made it so it was easy for us and Rascal to succeed. Bottom line Allison is AMAZING to work with- she saved Rascal. **Please note that I cannot guarantee that behavior modification for your dog can be completed in the time frame of the package you purchase. If we finish early, I will work on other skills to fill up leftover sessions. If we need more time, I'd be happy to extend your package. Contact us for more information or to figure out which program is best for you!